Yet another Japanese brokerage has confirmed the trend of slumping trading volumes in the region. While monetary policy officials are refraining from announcing additional quantitative and qualitative easing measures, the Japanese yen is experiencing a decline in trading activity. 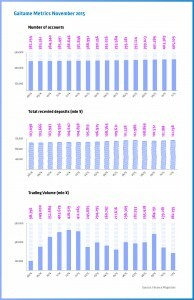 Trading volumes in November have declined by 25 percent to ¥18 trillion ($148 billion), while total trading accounts numbers increased by 1800 to 405,109. The total amount of funds deposited at the brokerage has also increased somewhat, marking ¥11.2 trillion from ¥11.1 trillion in October. Nevertheless the figure remained below the record high set in July this year at almost ¥11.3 trillion. As previously reiterated by Finance Magnates, the major central bank’s decisions due this month have also played a factor in the trading activity decline. With the European Central Bank out of the way we only have one additional big news item remaining – the prospect for the first rate hike from the Federal Reserve in about a decade. With markets reactivating wildly after the ECB rate decision, we may yet see some trading activity pick up in the aftermath of the Federal Reserve’s decision. Due to the factors mentioned above, we are seeing the seasonally weak trading volumes in December compensate somewhat for the dismal numbers in November.